Family card games are one of the easiest ways to spend quality family time together. They’re inexpensive, small enough to bring with you anywhere, and there are games for all ages. These are the perfect indoor games! My favorite “secret” mom weapon is a deck of cards. If the power goes out, knocking out our electricity, it’s a fool-proof way to stay entertained. If the kids are getting restless at a restaurant because it’s taking a while for our food to come out, we can play a quick card game. When my daughter was in her anti-math phase, we played card games that subtly exercised her math skills. If we get stuck in traffic, I can whip out the cards so the kids can play a fun card game rather than whine incessantly about how bored they are. Even though my kids span ages 6 to 16 years, there are so many family card games that are easy enough for the young one to play and entertaining enough to keep my teens engaged. Now that you have decks of cards stashed everywhere that you might possibly need them, let me give you share some fun card games with you that your family might enjoy. Children as young as 3 can join in fun family card games. These games are actually great ways to help them develop skills and knowledge too! All cards are dealt to the two players and kept face down. Neither player must look at their cards. Both players turn over the top card of their piles and put them face up in the middle of the table, beside the other player’s card. Whoever has turned over the highest ranking card takes both cards and adds them to the bottom of his pile. This continues until two cards of the same value are put down together. The game is now in a state of “war.” To continue, both players take two new cards and put one face down on top of the card they have already placed in the middle and one face up. Whoever puts down the higher ranking face up card wins all six. The game is won by the player who collects all of the cards. Each player sorts their cards into groups of the same number or suit (i.e. group of threes or group of kings), making sure not to show anyone. The “requester” (person to the left of the dealer) starts the game by asking another player for cards that will match his hand. For example, if the requester has two kings, he will ask the other player for kings. If the other player has these cards, he must hand them over. The requester continues asking the same player for more cards until the player does not have the cards he wants. If the player does not have the right cards, he can tell the requester to “Go fish.” The requester then has to take one card from the “fish pond.” The player who told him to “Go fish” becomes the new requester. Anyone who collects all four cards of a set puts them face down in front of him. The winner is the first person to have no single cards left, only complete sets. If two people run out of cards together, the player with the most sets wins the game. A standard deck of 52 cards is used, but with one of the Queens removed. This leaves a pair of Queens in one color and a single Queen (the old maid) in the other. All the cards are dealt, face down. It doesn’t matter if some players end up with more cards than others. The players then sort their cards, keeping them hidden from all other players. Anyone holding pairs of matching cards, with the same number or picture, should put them down face up. If anyone has three matching cards, he only puts down one pair and keeps the spare card. If anyone has four matching cards, he puts down two pairs. The player to the left of the dealer then fans his cards in his hand so he can see them all, although he keeps them hidden from the other players. He offers them to the player on his left, who cannot see them, but takes a random card from the fan. If the card he picks matches any he already he has, he puts down the pair. If not, he keeps it in his hand. Then, he, in turn, fans his cards and offers them to the player on his left. This continues until all the cards have been put down in pairs, except the Old Maid, which is left alone and cannot be paired. The person left holding this card is the Old Maid, and loses the game. Older children can use the whole deck of 52 cards, but younger children may want to use fewer cards. Make sure the deck you use is made up of pairs. Shuffle and spread cards face down on a table between the players. Cards can be laid in a random pattern or in a grid. The object of the game is to find matching pairs. Players take turns turning over two cards and letting all the players see them and study them. If they are not a matching pair, try to remember what and where they are, then turn them back over. The next player turns over two cards. If they are a matching pair, that player removes them from the table and keeps them, and then has another turn. When all cards have been removed from the table, each player counts up the number of cards they have collected. The player with the most cards wins. Once kids know numbers and start to understand game play better, you have plenty more fun card games for the family to choose from! How to play: In a two-player game, each player is dealt seven cards. In a game with three or four players, each player is dealt five cards. The rest of the deck goes facedown in a pile, with the top card turned up beside it. This is the discard pile. The player to the left of the dealer discards a card from his hand that matches either the number or suit of the top card in the discard pile. For example, if the card is a five of hearts, he could play any heart or any five. If he does not have a matching card, he continues picking up cards from the deck until he gets one that is playable. Eights are wild and can be put down on any suit. For example, an eight could be played to match a heart. The next player must match their card to the number or suit that the eight was meant to cover. Play continues with players matching the card at the top of the discard pile. The first player to use up all his cards wins. If the deck runs out before the game is over, the discard pile can be used. For each player, take four of a kind out of the deck and put aside the rest of the cards. If you are playing with younger children, try to make sure that the cards are as different from each other as possible. For example, if you were playing with 3 players you might choose the 4s, 8s and Queens. Shuffle your chosen cards well. Deal the cards so that each player has four. Now each player looks at their hand and sorts the cards out. The aim of the game is to collect four of a kind, at which point you quickly, and quietly, put a finger on your nose. If you see another player put a finger on their nose, you must do so too (regardless of whether you have 4 of a kind or not). The last player to put a finger on their nose gets a letter – first P, then I, then G.
To play, choose which cards you want to collect then choose a card to discard and put it, face down, on the table in front of you. When everyone has a card on the table, simultaneously pass your card to the player on your left and then pick up the card which has been passed to you. Try to establish a rhythm – it can help if an adult says “down – pass – pick up, down – pass – pick up” to keep everyone going! The first player to reach “P-I-G” is the loser. If you want a longer game, try playing with D-O-N-K-E-Y instead. Deal the cards out completely, face-down – don’t worry if the numbers are uneven. The player to the left of the dealer starts by turning the card on the top of his pack face-up in the middle of the table. Play continues with each player adding a card to the face-up pile, until somebody turns up a Jack (Knave), as which point all players try to be the first to “slap” their hand over the stack. Whoever gets their hand their first take the pack and adds it to the bottom of their pile. Deal the cards out completely (don’t worry if some players get more than others). Players sort the cards in their hands by rank: the object of the game is to get rid of all your cards. The player to the left of the dealer starts by placing any card down on the table. The next player looks to see if they have a card of the same rank. If they do, they place it down on top of the card, saying “Snip”. If they have another card of the same rank, they place it down too, saying “Snap”. If they don’t, play passes to the next player, and so on. Whoever places the final card of that rank says “Snorem” and wins the right to start the next round with the card of their choice. Children will soon learn that it is best to lead with a card in which they have more than one of a kind. In this game, cards are ranked in numerical order (2, 3, 4, 5, 6, 7, 8, 9, 10, Knave, Queen, King, Ace). Cards of the same suit make up a sequence. To start, the whole deck is dealt clockwise around the group, all dealt cards kept face-down. It doesn’t matter if the dealing is unequal. The player to the left of the dealer places his lowest card face up on the table. Then, the player who has the next card (or cards) in the sequence plays it. Play continues until the entire sequence is complete, from 2 to Ace. Then, the next sequence is begun by whoever played the last card. The winner is the player who is the first to get rid of all his cards. These games are a little more complex and involve some math or strategy skills that younger children may not yet have developed. All of these fun card games can be played for stakes, providing an opportunity to teach kids money and counting skills (we usually play with pennies, jellybeans, or M&M’s). Each player is dealt one card facedown, then another card, face up. Each player (including the dealer) peeks at his facedown card, silently adds up the value of both cards, then antes up jelly beans (you can set a limit if you like). Play continues until everyone is busted or stuck. Whoever has the hand closest to twenty-one without going over wins all the jelly beans. An ace and one of the two black-colored jacks beats anything else. A tie splits the pot. The dealer then puts the used cards aside and deals again from the original deck. Each time the cards in the deck run out, change dealers and reshuffle. The object of the game is to get rid of your cards as you group them into “melds.” A meld is a set of three or four of a kind, or a “run” (three or more cards in order of the same suit, such as the three, four and five of hearts). The “dealer” shuffles the deck and deals the cards one at a time to each player as follows: Two players get 10 cards each; three or four players get seven cards each; five or six players get 6 cards each. The remaining cards are placed face down in the middle of the table and serve as the “stock” pile. The top card of the stock pile is turned face up and set next to the stock pile; this card begins the “discard” pile. Each player then groups all matching cards and runs together in their hand, which makes it easier to see the melds in their hand. Do not show the other players. The player to the left of the dealer plays first by taking the top card from either the stock pile or the discard pile. If the player has a meld, he will lay it down on the table so all cards in the meld are visible. Then he will discard another card from his hand by placing it face up in the discard pile. Players can also place a card down on any existing meld if they have a card that matches the meld or if they draw a card that matches the meld. For example, a player could lay a queen down onto an existing meld of three queens. The game continues clockwise around the table with players drawing a card from the stock or discard pile, making melds and laying down a card in the discard pile. The first player to get rid of their cards wins the round. Win the entire game by being the first to win five rounds. Stud poker is the easiest type of poker there is. The dealer deals out five cards to each player, starting on his left and moving to the right. Cards can be dealt one at a time, or all at once. The players then look at their hand and assess the strength of what they have (high card, pair, straight, and so forth). Each player is given a chance to make a bet. The player who makes the biggest bet wins, unless another player matches the bet. At that point all the players who match the bet lay down their cards, and the player with the best hand takes all the bets. Draw poker is similar to stud, but a little more complicated. Cards are dealt in the same manner, but the players may each choose to trade up to three cards to the dealer for three new cards one time. Once all players have had this option, betting begins. Beginning at the left of the dealer each player may bet. Players have four options during betting; raise (a player may increase the bet required to keep playing), fold (a player who doesn’t think he can win may opt out of the round and turn in his cards), call (this means the player meets the bet required to play), and check (which means that a player is passing to see what other players do before making his decision). At the end of the round all players who are still in the game must turn over their cards, and the best hand takes the pot. If you need a refresher on which poker hands beat what, click here. Building a house of cards requires fine motor skills and patience, skills that most young children are lacking so this might be a more appropriate activity for older kids. When I was nine years old, I used to do this all the time in lieu of playing solitaire. My teens often compete to see who can build the tallest tower. So, it’s an activity that can be played alone or with others, as long as everyone has the right temperament to work slowly and carefully. Several of my kids’ teachers have used playing cards in the classroom to play math games. Check out Crewton Ramone’s House of Math for several math variations of War. Here’s a clever twist on Memory from Guided Math – Remove the face cards from the deck before laying out the cards face down. Instead of making matches, make pairs that equal 10. Yahoo Voices has over a dozen math card games for varying ages and skill levels. Does your family have other fun card games they like to play that aren’t listed above? If so, please share them with me in the comments! 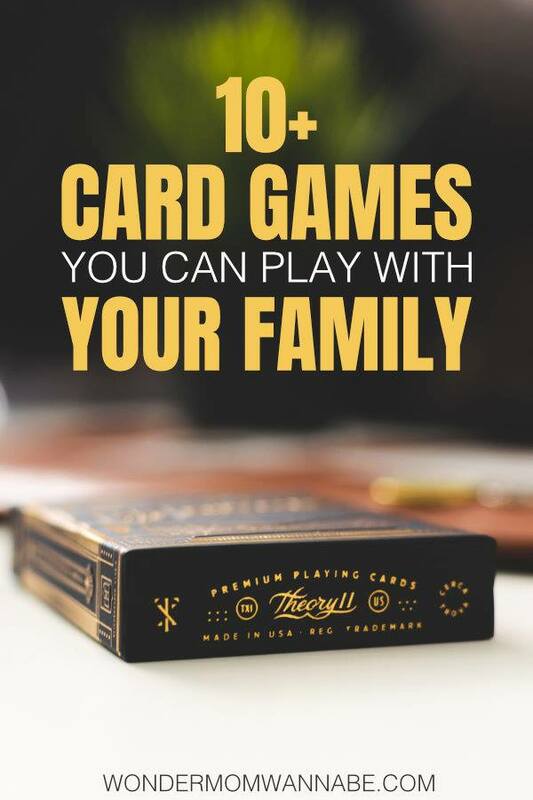 I love this list, my little one loves card games and this list will help keep things interesting! LOVE the post! I remember when I was in HS and college I tried to keep a deck of cards in my purse too! lol. And I wasn’t quite a “kid” then. And I LOVE your new design! How fresh and fun and easy to read/find things. I agree with having a deck of cards handy. We always have a deck in the car also. This has been a great way to teach my children with concentration, memory, math, strategy, and sportsmanship. My 7yo recently wanted me to teach him pinochle and he loves it! What a smart idea! I can’t wait until my kids are a bit older and we can play games other than 52 card pick up. My son enjoys playing cards games. Thanks for reminding me of some new “old” games. Awesome list! I love card games and I’d love to teach some to my nieces and nephews! I love cards. I collect different types of set, the special ones don’t get used. The dime a dozen ones get played with all the time, I just love card games. Wow! I always thought it was gold fish! lol! Rummy is my favorite game but I like this list.